Biscotti flavor is sure to bring out the crunchy almond taste in your favorite treats. The flavor is unique because of the yummy taste it retains in desserts and pastries. 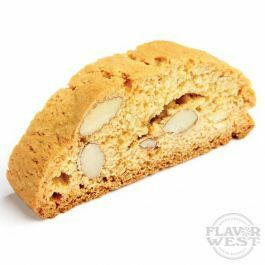 Type: Biscotti Water Soluble Flavoring. Ingredients: Natural and Artificial Flavoring and Propylene Glycol. USP Kosher Grade Flavoring. Usage Rate: 15-20% for E-use. Flavor suitability: Drinks, desserts, pastries and more. Specific Gravity: 1.11 No Refunds on Flavoring.